Click here for the left view and for other works from the Cappella Brancacci. Painter Tommaso di Christoforo Fini was born in Panicale, Italy and called Masolino (Little Tommaso) – hence the name by which he is known: Masolino da Panicale. Some aspects of Masolino’s life are unclear because another artist with a similar name was active during his lifetime. Even the artist and biographer Giorgio Vasari was inaccurate in details about him. According to Vasari, as a young man Masolino worked for Ghiberti. Yet, known facts indicate this information is likely to be incorrect. Also, because Masolino worked closely with Masaccio in the Brancacci Chapel, there are questions regarding correct attribution of some of his paintings. 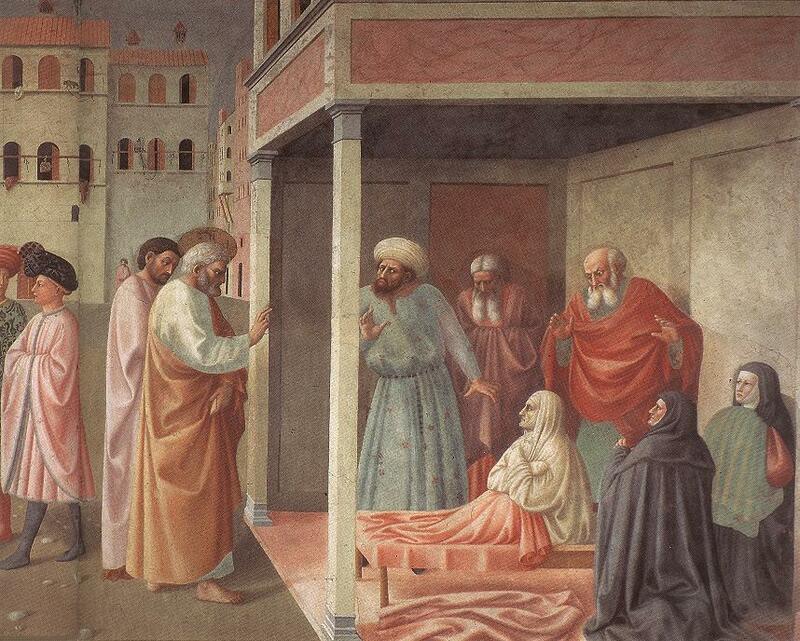 The fresco, “Healing of the Cripple and Raising of Tabitha,” however, is regarded to be the work of Masolino alone. In the Acts of the Apostles an account is given of a time when Peter was in Lydda. He encountered a man who had been paralyzed for eight years and he said to him “Aeneas, Jesus Christ heals you. Rise up and make your bed.” (Acts 9:33-35). Aeneas was healed. Another account took place in Joppa where a woman named Tabitha had died; she had been a person “…full of good works and acts of charity.” Peter, being in nearby Lydda, was asked to go to her. He went, prayed, and said, “Tabitha rise!” She opened her eyes, saw Peter and then sat up (Acts 9:38-42). These events did not happen on the same day, not in the same town, and definitely not across the street from each other. Yet, Masolino combined the two stories in a single painting. He placed both miracles in an early fifteenth century Italian architectural setting in a pictorial space that was created by recently discovered linear perspective. On the left side of the painting, Peter is healing Aeneas and then on the right side (the portion shown above) Peter is across the street raising Tabitha from the dead. In the biblical account, Tabitha’s body was placed in an upper room. Masolino used artistic license and placed her conveniently at street level in a covered porch. In Acts, both the Jewish name, Tabitha, and the Greek name, Dorcas, are given as the name of the woman who was raised from the dead. They both mean “gazelle.” The use of the two names for the same person suggests this Gospel was intended for Gentiles as well as Jews. Placing separate events in a single painting (as we see in the work by Masolino) is a compositional device used regularly by contemporary artists. If an artist today were to make an image using a photograph of Julia Child chopping onions and then were to combine the photo digitally with photographs taken at a later date while she was stirring beef stew or baking a cake, we would accept it as “composite information” about Julia. The terms “correct” or “incorrect” do not apply to this form of composition. Previous Previous post: Prayers to begin, but what is to follow?